Note: this web page is a work in progress. 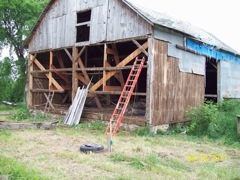 Deconstruction of this barn was begun in June 2011 and I will be documenting it's progress - on this page - as time permits. 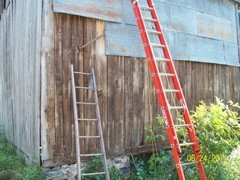 Removing tin siding to expose white pine barn boards. 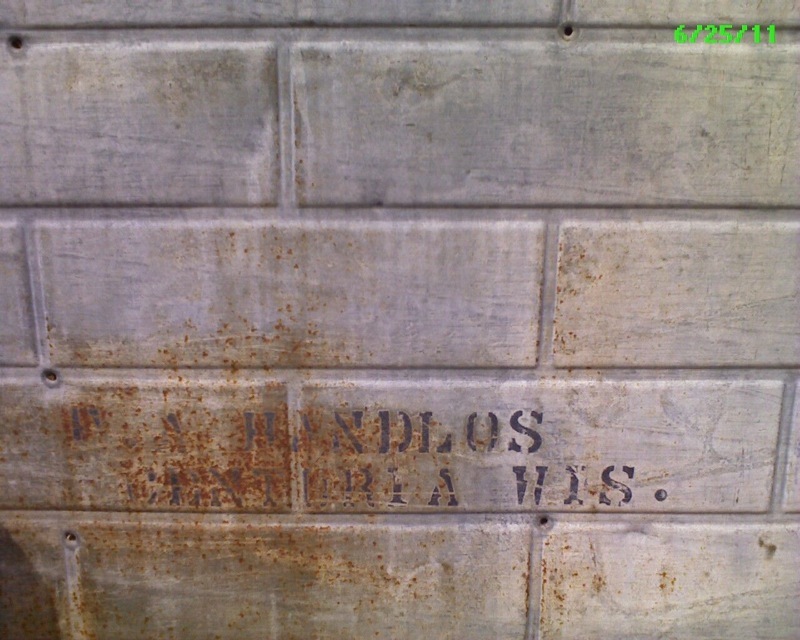 Tin in good condition and will be preserved as best as possible during this process. 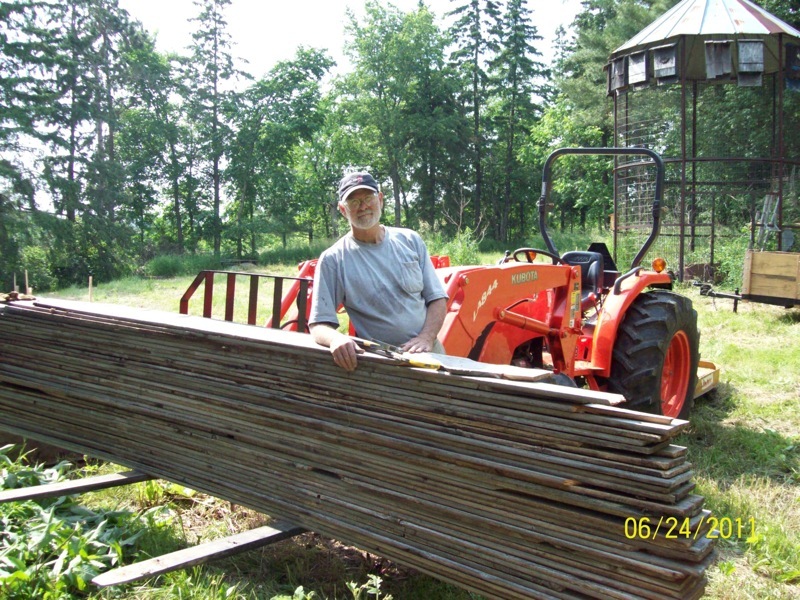 There are a TON of nails holding each panel. 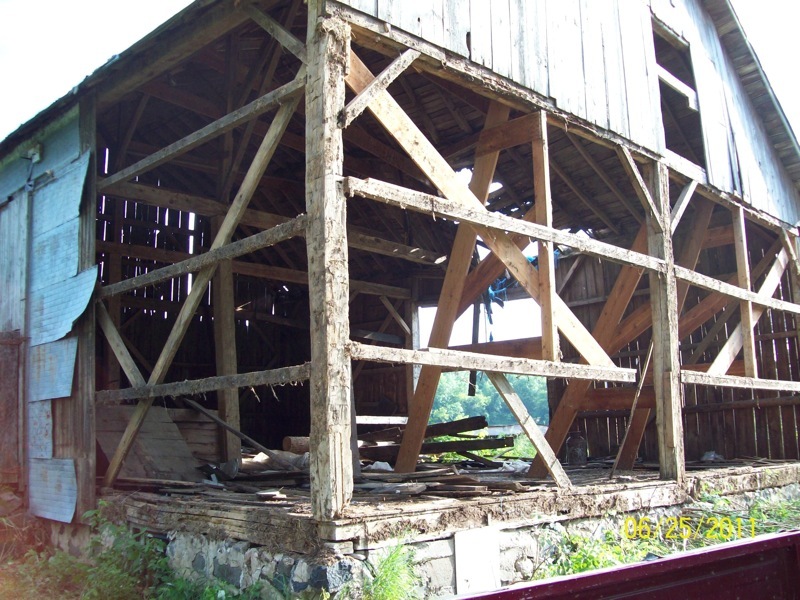 Exposed north side that shows some of the bracing and buttressing that was added to strengthen and straighten the barn (sometime in the 1970's), I'm hoping this will hold the barn up while we continue to salvage the siding. These boards replaced the entire north wall that was blown out by the tornado. 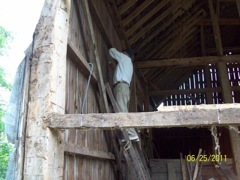 They were the only materials purchased (aside from shingles) to rebuild the barn after the tornado. 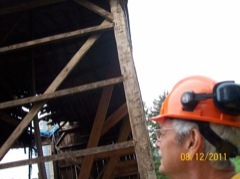 The siding boards that had covered this wall were were blown off by the tornado and were recovered from the fields and forests and used to rebuild the roof. 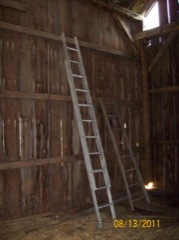 Getting a roof on the barn was, of course, the top priority. When we started removing tin from the east side we discovered that the nails had been bent over on the inside. I can imagine this was so people weren't maimed by them when they were pitching hay around in the mow. These would have been very dangerous. 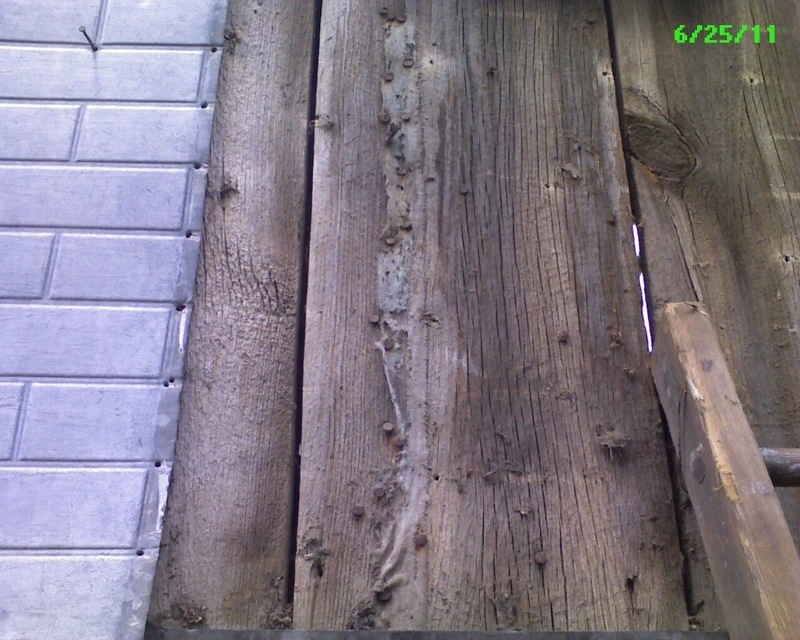 I'm not sure why I didn't see this on the west side but I suspect they used smaller nails on that siding. Anyway, each nail had to be straightened from the inside and pounded out before the siding could be removed. At about noon on the second day, David was pounding from a ladder on the inside and I was removing tin and wall boards from the outside. David felt the beam his ladder was resting on move in a way that he didn't like so we decided to quit on day two at about lunch time. We needed to stop and think about danger and about what, if any bracing needed to be added to make continuing a safe thing to do. 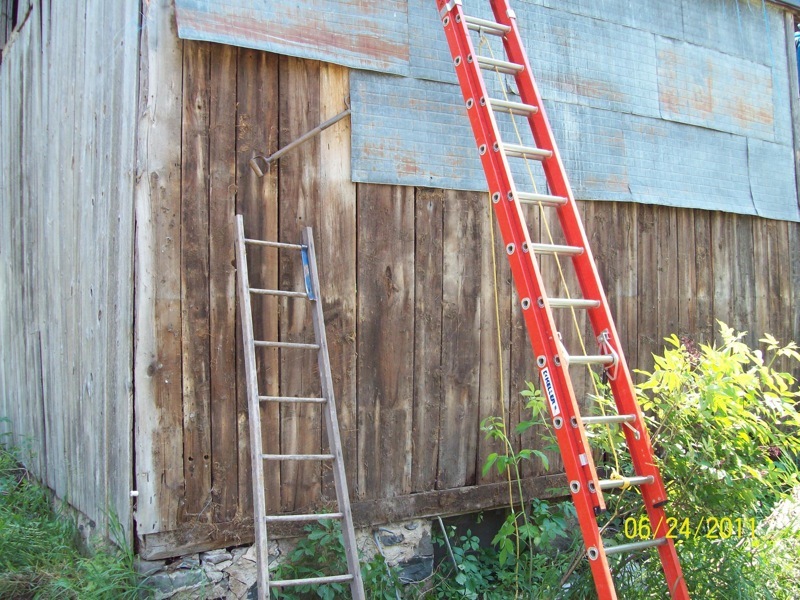 As we removed the siding tin we found what appears to be the remnants of canvas had been tacked to the boards before the tin was installed. 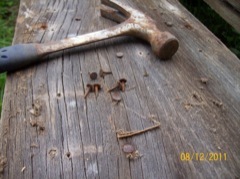 Short (1/2 inch) large headed tacks were used. We can't figure out the purpose unless it was a form of vapor barrier - like tar paper or plastic wrap is used today. 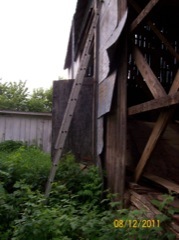 This tin siding comes off in aprox. 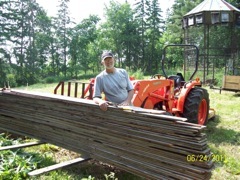 3X5 foot sections. Many of these pieces had a this stamp on them. 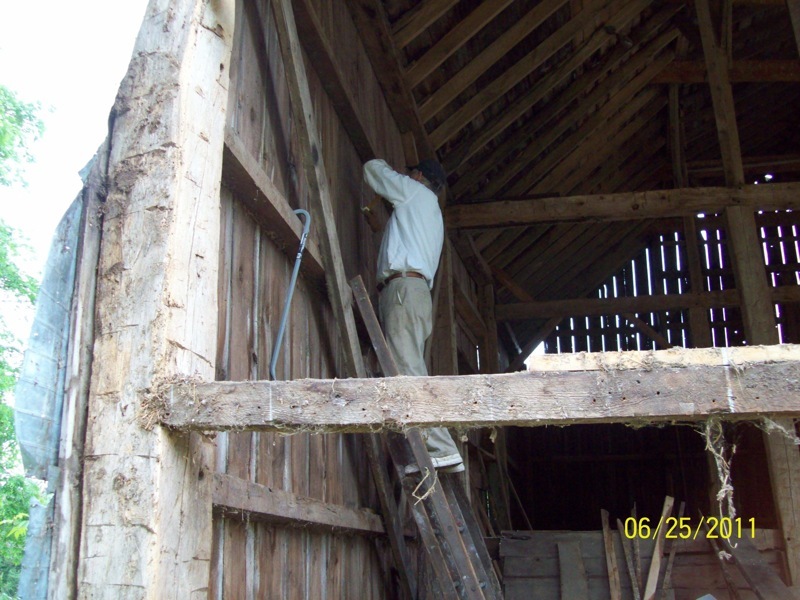 We know the name of Handlos - this is a successful farmer in the area - but we don't know what they would have had to do with this barn. 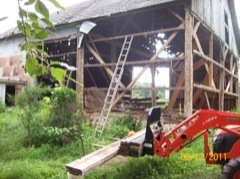 After evaluating the stability of the remaining structure (and thinking over this problem for nearly a month), I added some bracing across the beam framing and chained (with a come-along ) across the diagonal of the remaining strong framing beam section to counter any slight leaning the barn was doing. 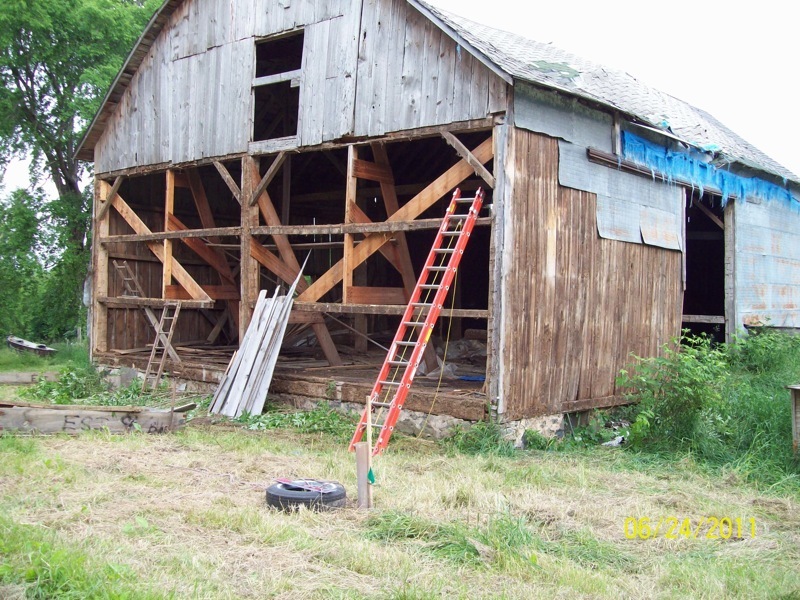 In comparing pictures of the current structure with those of the structure before we started, I could see no evidence of any change in the position of this barn. Contrary to the looks of this picture (goofy perspective) the barn frame is fundamentally straight and the internal bracing is sound. However, I will be very careful to notice any evidence (sight, sound, or feel) of shifting from here on. 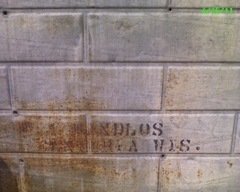 North section of east wall is complete. Also removed was the large eastern door. 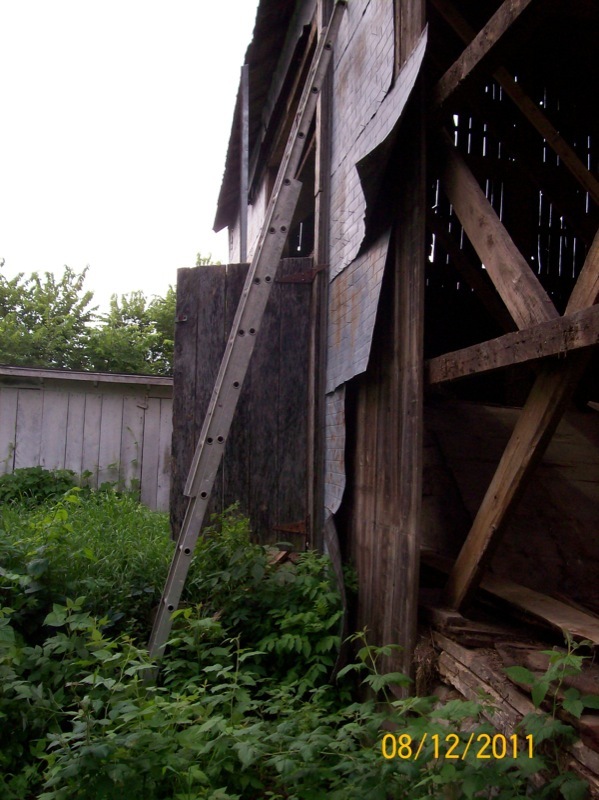 Much of this tin was salvaged as well as the long barn boards. 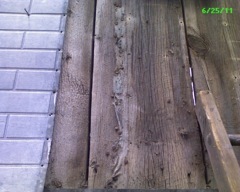 Every siding nail had been bent over on the inside. 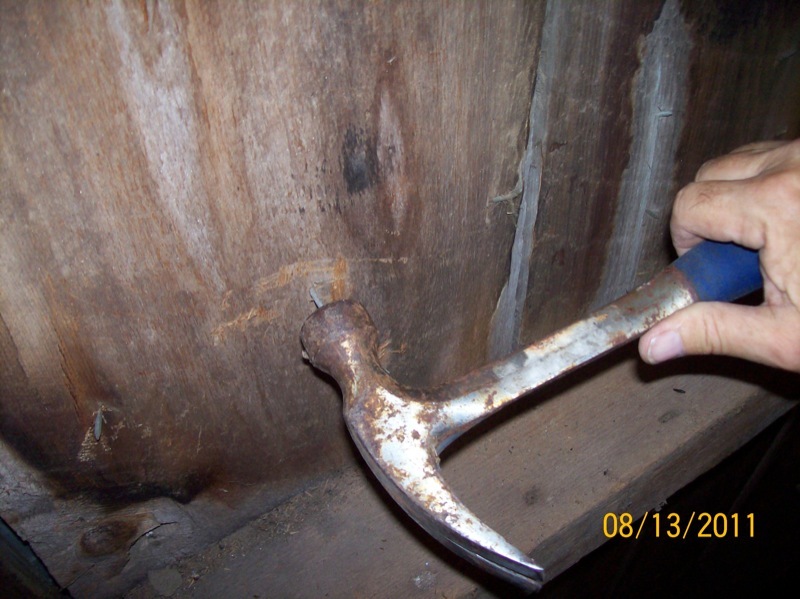 Every siding nail needs to be straightened and pounded though from the inside before the tin siding piece can be removed. This is a long and arduous process. But it's inside work and since it was raining this day it didn't bother me too much to take this time. 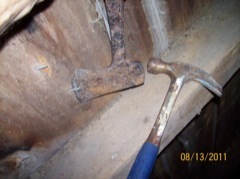 Many of the nails were pounded over with some gusto and required the use of a hatchet to dig them out of the wood. Once this was done I could slide the claw of the hammer under the nail and bend it straight. 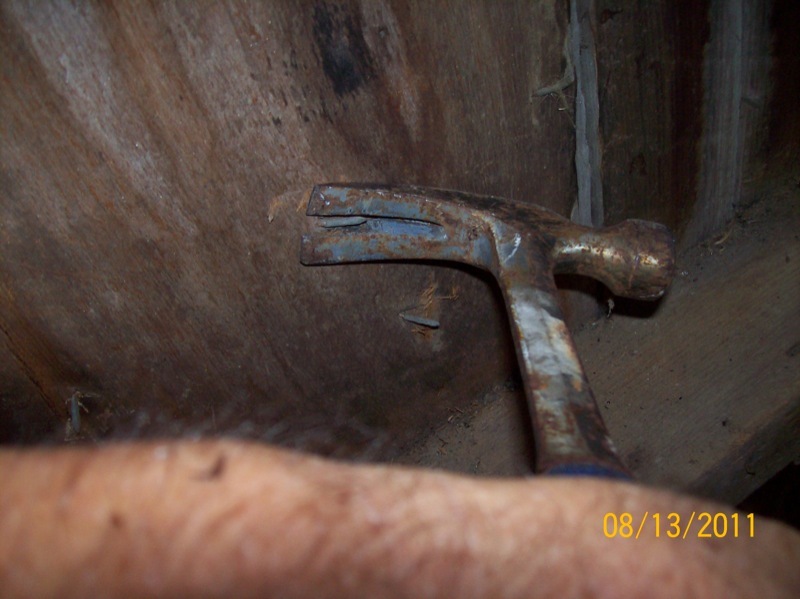 It wasn't necessary to pound the nail through but it made it much easer to pull it from the other side if it had already been started. These old nails are hard to start since they've been in the wood for so long. 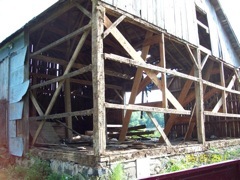 Please procede to Phase II section to continue the story of deconstruction/disassembly of this barn: [Click here to continue].